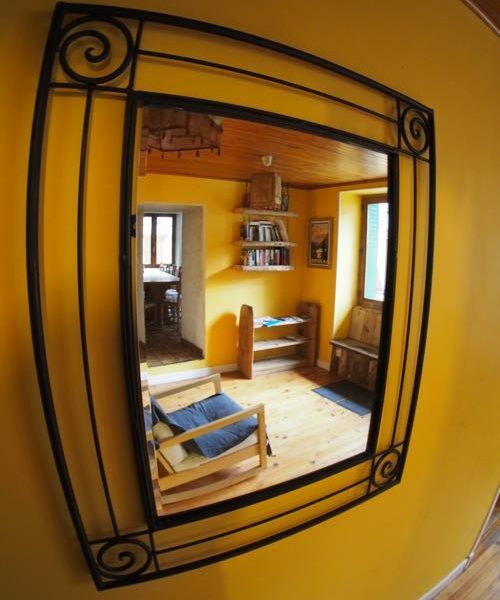 The BikeVillage holiday accommodation is nothing less than our own French farmhouse, near Les Arcs. 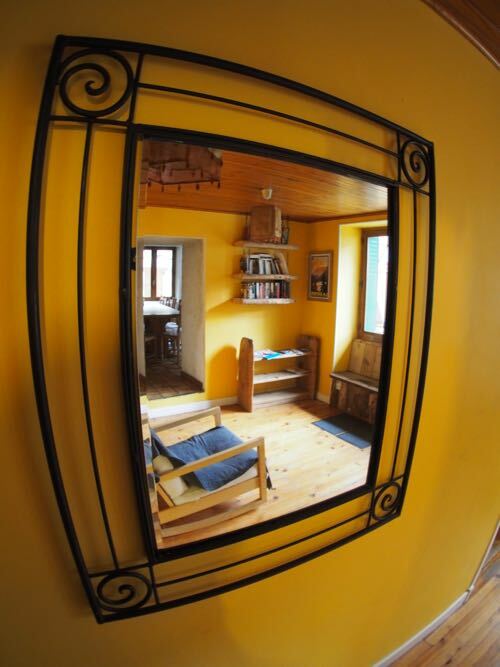 This is not just a rented ski chalet – you really can make yourselves at home in our accommodation, and enjoy great home-cooked and often home-grown food. By the time you leave you’ll have a totally new concept of what makes a truly great mountain bike trail. Plus you’ll have some new riding friends to help you through the post-holiday riding blues! 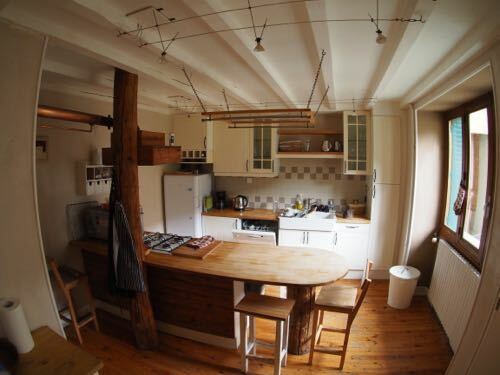 ‘BikeVillage Towers’ is a lovely old farmhouse, built in 1637 on the forested edge of a village called Landry, which is in the French Alps. 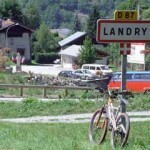 Nestled in-between the ski mountains of Les Arcs and La Plagne, Landry is a traditional Savoie village, complete with a beautiful baroque church, a couple of bars and and two friendly local restaurants. A white water rafting centre and café is also just a stones throw away. 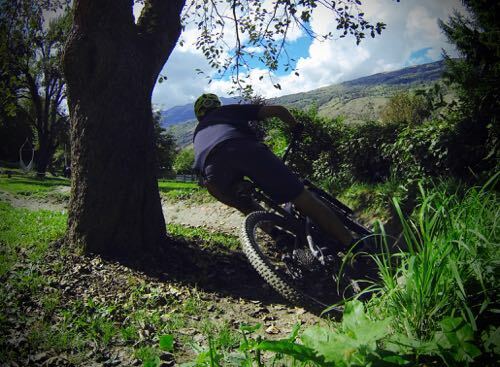 something you will come to appreciate – it’s always downhill at the end of the day’s mountain biking! Bourg St Maurice is just a short ride along the bike path if you ever fancy a slightly more cosmopolitan drinking/eating environment. The other direction is the plan d’eau swimming lake, a top spot to swim, eat, sunbathe and people/mountain watch after a ride. 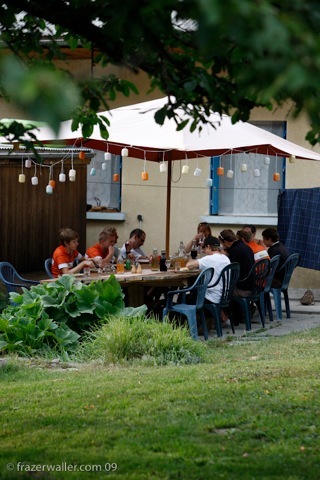 BikeVillage’s holiday accommodation sits on the edge of Landry. 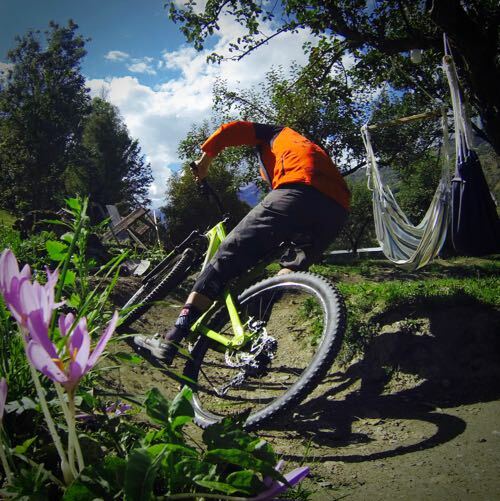 Our garden backs onto our own pump track, which itself backs onto the singletrack-packed forests below Les Arcs. The post-ride evening light also helps warm the swimming pool and terrace, where aperitifs and canapés are served each evening. This is a holiday after all! The farmhouse is a very nice place indeed. It has everything you need for a bike holiday. 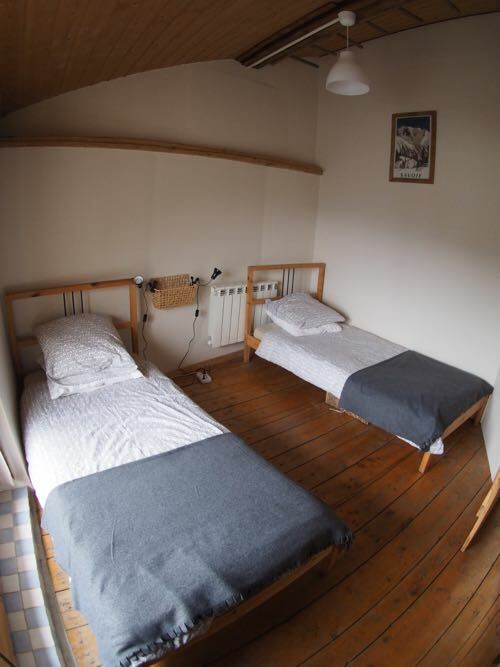 From the basement with full workshop, bike storage and compressor for tubeless time saving, to the large open plan lounge with comfy chairs and an open fire for night-time loafing. 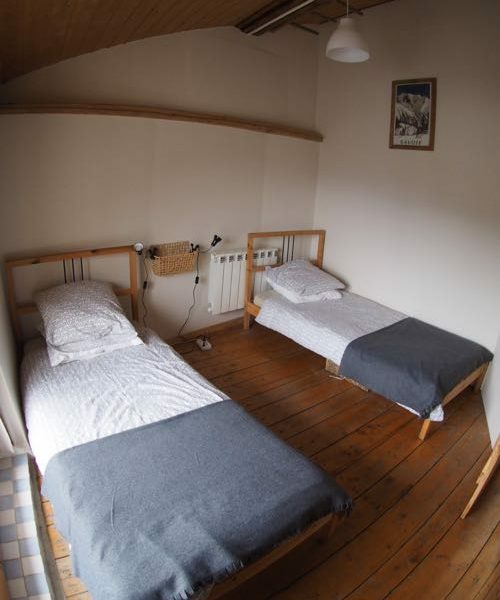 There are seven guest bedrooms for 14 guests (five twins, one twin/triple and one single) and five bathrooms. This enables us to cater for single travellers, groups and couples alike. Outside you’ll find our lovely (and huge) back garden. Stretching from the patio, past the swimming pool and sun terrace out past the ping pong table, to the lawn and out to the shade of the fruit trees, the veggie patch, the hop plants and, of course, the BikeVillage pumptrack. 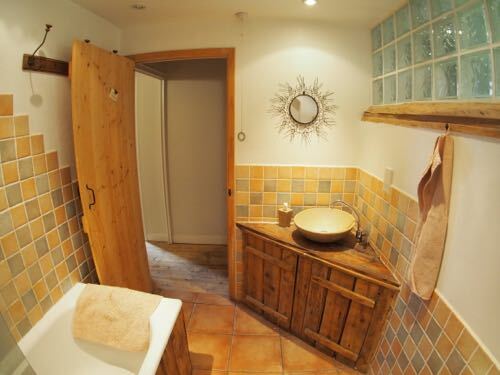 The farmhouse is much more homely than your average chalet. When we get in from riding you’ll have the run of the place. 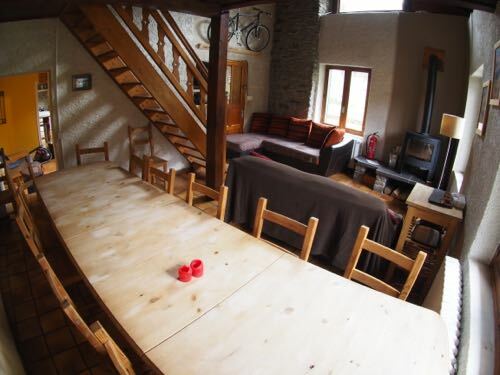 You could pour a cup of tea, eat some home baked cake or fix bikes on the patio whilst recounting the day’s adventures. 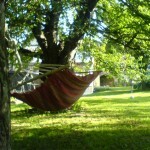 Perhaps you’d prefer to slink off with a book and lie in the hammock, under the shade of the cherry tree. A late afternoon alpen-glow kind of moment. One of the best things about mountain biking is the appetite it gives you! 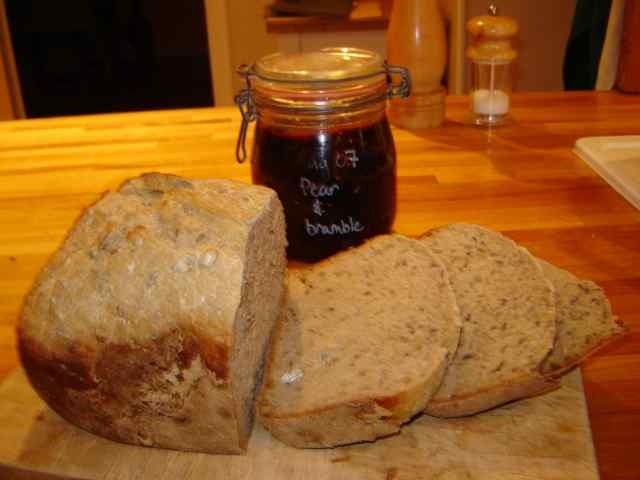 Wake up to the smell of warm, fresh bread baked in the BV kitchen. some early moring banter as you start to get excited about the day’s riding. As if by magic, your lunch is waiting for you to pop into your pack. 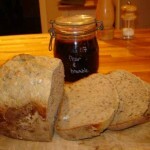 Today it might be goats cheese, ham and quince + chilli jelly in a flute, which is just a bigger version of a baguette. There’ll also be a banana and/or some cereal bars, along with the stash of Haribos, choccy biccies and madeleine cakes that the guides always carry, just to keep us popular. We’ll stop twice for lunch, partly ‘cos we love eating in beautiful alpine meadows and also so that our legs don’t feel too heavy when we have to get moving again! When we get back from riding we’ll pop the kettle on and you can tuck into a mug of tea or maybe a sly cold beer from the beer fridge and some home-made cake or flapjack or whatever has tickled our fancy that day. By the time you’ve showered and had a drink and a post-ride natter in the garden, it’ll be time to enjoy a quick canapé and maybe a pre-dinner aperitif in the evening sun. In the meantime, dinner will doubtless be on the go. Tonight it might be roasted feta and wild mushroom stuffed chicken breast wrapped in parma ham served up on ratatouille made with courgettes from the garden and quinoa. …All that remains is the wine! Sam used to work in a nearby wine shop during the winters and is pretty into the grapey stuff. We still get our wine from his old boss and the inside knowledge shows – it’s a Vaucluse that we drink which is essentially a Cotes du Rhone, light enough to quaff every night but with a complexity and depth of flavour that would put a lot of new world wines to shame. We’re not exactly shy with it either so get stuck in! Luckily dessert goes into a different space to all other food (we call it the ‘cheesecake stomach’) so there’s always room for some. It could be an oaty crumble made with apples and plums from the garden and served with custard or maybe Lyndsey’s slightly famous dark chocolate mousse – it has been known for guests to check this is on the menu before re-booking! Tea, coffee or an infusion picked fresh from the herb garden next to the dining table will finish things off whilst you sit back and look at the stars over the moonlit mountains. Even the keenest of riding beans will have pretty tired legs by the time Wednesday and the rest-day rolls around, so you may well be in good company! We can easily arrange a ton off stuff to do. We can book a massage with Massage Me for you to enjoy in your room or under the cherry tree. 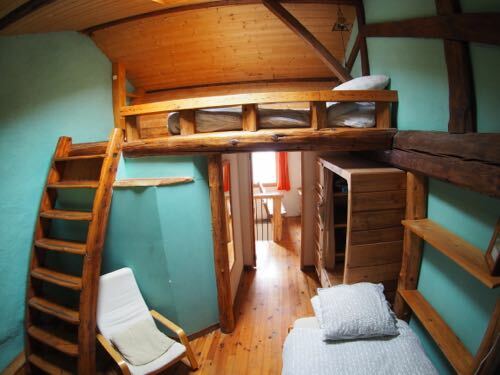 Or we can send you on a whitewater rafting or paragliding adventure! You could roll down the riverside bike path to the huge swimming lake and grab lunch at the café. Maybe you would like to head into Bourg St Maurice for a coffee or a beer. Those eager to enhance their biking skills can ride a few laps of the pump track at the BikeVillage chalet. 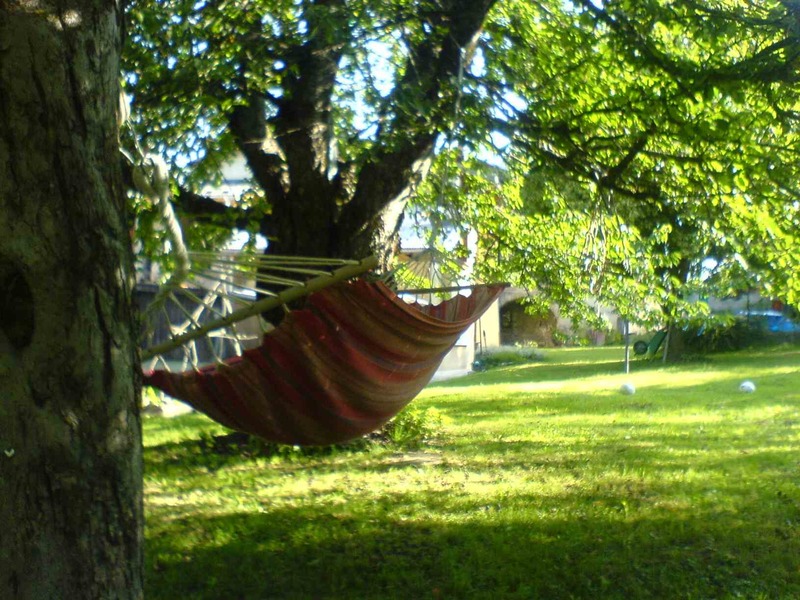 Or lie you could simply lie in a hammock and read a book in the shade. After all that stroll into the village for an evening meal. 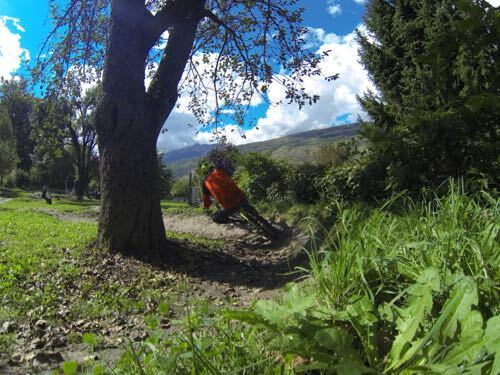 Flying: Just make sure you arrive at Geneva on a Saturday before about 4pm local time and that your return flight departs after 12.30 and we’ll pick you up and drop you off in the Bikevillage minibus (€35 each way). If you need to fly outside these times then pickups can usually be arranged but will cost €75 per person each way as we have to get someone else to do it, something to remember before you save 50p booking the 5.30 a.m. departure! Tips on packing your big can be found on the FAQs page . Once you land at Geneva, the trollies take €2 coins, supermarket trolly tokens or (don’t tell them we told you) good old 2p coins, which you’re probably more likely to have jingling around in your pockets. Driving: More and more guests are now driving out to us in the summer. 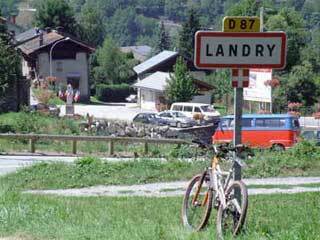 Landry/Les Arcs is a steady 10 hours from the channel ports and this is a good way to travel if there is a convenient group of you. Autoroute tolls will be about €60 each way and fuel is a little cheaper than at home. Train: Just book a Eurostar service to Paris and then the TGV to Bourg St Maurice. The train actually stops at Landry, about 2 mins from the BV farmhouse! If you are interested in this option then visit RailEurope. 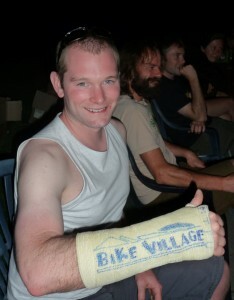 Us mountain bikers do like to crash from time to time. As such, insurance is vital, along with your EHIC (new E111) card. Just make sure the policy covers you for mountain biking in the Alps and that you bring out both your policy details and your EHIC card with you – they’re no use at home on the kitchen work surface! We thoroughly recommend Sportscover direct, just click the icon to book your insurance now. If you also want to insure your bike against theft or damage whilst it’s out here. It’s probably best done under your house insurance or via British Cycling or Cycling UK membership deals – the BV house insurance does not cover your bike! Thanks Lee – great to meet you too & look forward to seeing you again next year!